Panjabi samosa ..don’t get worried whether the “Punjabi” samosa looks any different from the samosa next door… n for heaven’s sake don’t imagine it with a turban!! A confetti of biscuits… with about 6-7 assorted biscuits in a pack.. some salty ones, creamy ones, glucose ones and other ones whose contents I don’t know..
And then offcourse I can choose between tea and milk-water.. If you are interested in Operations research, take a look at my decision tree in the inset. 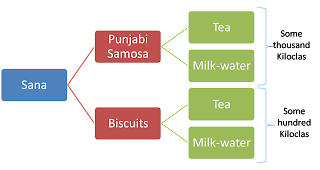 Ok so trying to minimize costs in terms of kilocals gained, I chose the option of bisc uits and tea. I decided to trade my creamy biscuits for lower cost (read calorie) salt biscuits with another friend.. He willingly agreed as the offered resource (read additional calories) was scarce in his territory… this going by the theory of comparative advantage.. I traded two for two.. then when my friend tried to push few more salty ones down me.. I declined.. you might ask why… and so did he..
My answer took us back to the early theories of trade wherein I was (imagine I am a country ) trying to run a positive balance of trade… if I took more biscuits than those I gave.. I would run a deficit. The theory that I am referring to, is called theory of Neo-merchantilism. Note that its not merchantilism as my motive for running the surplus is political.. i.e. to increase my “Sphere of influence”.. (CPJ will love this ;)..) and not economic benefits. That’s International business for you. I could have made it a more interesting conversation.. had I read more subjects..
Will try to come up with sequel to this once I do HR (then I can include appraisal and compensation aspects) and SCM.. (logistics.. its everywhere!).. Please don’t expect Marketing until exam end.. as I will only do it when the exam is. dont mind spelling mistakes in there.. its just increased influence of frns with bad spellings.. a countereffect of trade..
vote u as 'definitely' better than cpj!